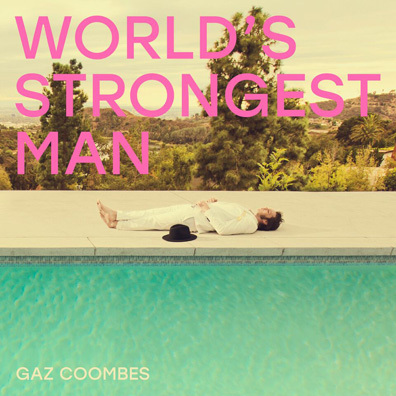 The third solo album from the former frontman of the defunct Britpop band Supergrass, sees Gaz Coombes settling in to his groove of nuanced pop rock that sounds both familiar and peculiar. World's Strongest Man is familiar as it contains similar timeless rock influences as found in Supergrass, such as The Kinks, The Rolling Stones, Buzzcocks, and David Bowie. Combining these influences into a stylish mix, the amiable melodies may sound similar to the undiscerning ear, but the songs soon distinguish themselves in differing ways, often revealing an understated transcendence after repeated plays. World's Strongest Man is peculiar in the way the tracks are also a sort of shifting musical matrix whose arrangements are sifted through a codeine gauze, fleshing out explorations of tone and texture within the context of the groove. The tracks are cleverly decorated with shadowy effects or imaginative passages while staying grounded by the steady rhythms and slick bass lines. The best examples being "Deep Pockets," "Walk the Walk," and "Wounded Egos." Each mesmerizes with a unique blend of faster-paced, slap-happy beats while the melodies and short guitar riffs add smarts and sass. Coombes' uncanny voice may be an acquired taste for some, often sounding like a funkier Thom Yorke, but his singing fits the shifting musical styles seamlessly without being overbearing. There are a few hiccups however. "Slow Motion Life" and closer "Weird Dreams" are a couple slower numbers that have good ideas but never develop into great designs. They're fine while they're playing, but never stick you with a desire to hear them multiple times.